Carmelina Cupo has a lot to say when it comes to both her music and the business that plays a big part in it. But despite all the hard work that comes with making music, it seems like she’s ready to take it all on. With idols such as Madonna, who apart from being a superstar is well-known as a cunning businesswoman, 24-year old Cupo remains smart and continues doing what she loves to do best: sing. With a voice like honey and an Italian-rooted natural beauty, this BC diva is ready to strike gold. Her debut album, I Don’t Look Like You, is a combination of “no-frills pop” and acoustic songs that focus on all subject matters. 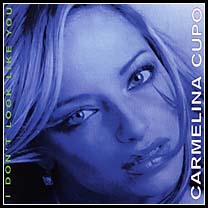 Produced by Darren Staten, I Don’t Look Like You resembles Natalie Imbruglia’s Left of the Middle, with added spice. A songwriter since the age of ten, Carmelina Cupo speaks from experience when dealing with issues in her songs such as envy, loneliness, and prejudice (all eleven songs on the album have been co-written by Cupo). Many potential hits are found throughout album, such as “Trust In You”, a song about believing, dreaming, and having faith in another person. “Life In The City” is another potential chart-topper, with its street-smart lyrics and wailing electric guitars. Although the first ten songs on this album are largely impressive, the best remains the last song, which bears the title of the album. “I Don’t Look Like You” is a song about discrimination because of differences in people. With a harsh but sadly realistic chorus that hisses the statement “We don’t like your kind around here”, the song will hit home with many listeners who have experienced similar prejudice. With her business smarts, looks and strong vocal ability, Carmelina Cupo is fit to stand out among her musical peers as, perhaps, the new Madonna of this current wave of not-so-bubbly pop music. Prospects look high for this future star.